BRUNET, BERNADETTE- Peacefully at Parisien Manor on Thursday, February 08, 2018. 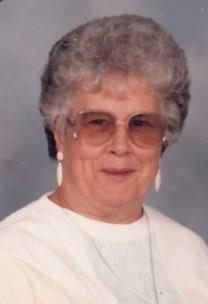 Bernadette Leona Brunet (nee Lalonde) of Cornwall; age 88 years. Beloved wife of the late Roger Brunet. Dear mother of Christine McPhee (Michael), Charlene Tessier (Gilles), Elizabeth Carriere (Denis) and Janice Brunet. Predeceased by two sons Garnet and Dwayne Brunet. Cherished grandmother of many grandchildren, great grandchildren and great great grandchildren. Dear sister of Chester Lalonde (late Gladys), Donalda Lalonde and Adele Prevost (late Romeo). Dear daughter of the late Daniel Lalonde and the late Elizabeth Kitts. Predeceased by four brothers Wilbert (late Dolores), Ray, Leonard and Amos Lalonde and two sisters Beatrice Wattie (Earl) and Gertrude Wattie (the late Charles). Resting at LAHAIE AND SULLIVAN, CORNWALL FUNERAL HOMES, WEST BRANCH (613-932-8482) from 2 pm Sunday. Funeral Monday February 12, 2018 in the Memorial Chapel of the Funeral Home at 11am. Interment Notre Dame Cemetery. The family will be in attendance from 2 pm to 4 pm and 7 pm to 9 pm Sunday and on Monday from 9 am until the time of Funeral. As expressions of sympathy memorial donations to the Lung Association or the Heart and Stroke Foundation would be appreciated by the family. Messages of Condolence may be left at www.lahaiesullivan.ca.